As I've reported I got a Horsemen HD45 camera and have one lens, so barring inclement weather or a reluctant photographer, I'm off and ready. Well, sort of. There are several things you have to do. One is simply becoming familar with the basics of the camera, like unfolding and folding it (the last thing you need is a broken part from not reading the instruction manual). Another one is the controls, finding all the neutral positions, trying all the movements, testing the levers and latches, and so. Kinda' like kicking the tires except you already own the car. Since we were in the middle of a week cold spell with snow and ice, I didnt' feel so bad about just setting it up in the living room looking out the window across the Narrows Strait. I got the 120mm lens mounted and installed on the camera to see where the focusing range is on the controls. I discovered, however, the 180mm lens I have, an APO Symmar-L which has a large rear group (inside the bellows) doesn't fit. It mounts on the lens board but is simply too large. So I have to find an older smaller version (f5.6) or a slower version (f8). Ok, practice, practice, and more practice... That's the rules. But then comes the real challenge. You have to find a way to carry all the stuff around in a handy, easy to use fashion. The reality is that longtime large format photographers have already figured this out (Like Duh? ), but newcomers need to think through things a bit. Fortunately, my decades of part-time photography experience, and my organizational thinking, helps. And you're saying, "Huh?". Remember, the last thing you need is to get there and find you forgot something essential or something you wish you had to make it easier. I follow a simply process where I visually walk through the process of getting there and taking a photograph. This helps define the checklist and the workflow there. There are some handy guides as mentioned in the previous post too. Remember to listen to those who have gone before you. You're not inventing anything new of discovering new territory here. And that's where the camera bag helps. It's not just a simple holder of stuff, but an organizational tool to help you when you get there. It's not like packing for a world cruise, but simplicity is the rule of thumb here, the obvious where it's obvious and the rest where it's easy to remember where it is. It's not rocket science, it just feels like you're going to the moon some days. So what's in mine? In the photo above, the obvious camera in the upper left, the film holders in the upper right. The lower right has the light meter with the spot meter attachment in the lower right above the ballhead. In the center is the loupe above the lens case with the lens. 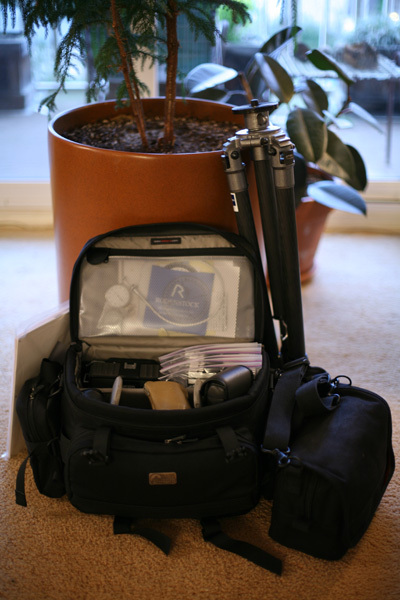 In left side pocket is the notebooks, pencils, etc., the center is the tools, filters, etc. The tripod is on the right leaning against the planter. Extra film holders are in the smaller bag and the folder with the composition and gray cards and printouts for help.